Department of Biomedical Engineering, University of California, Davis, CA 95616. Dynamic positron emission tomography (PET) can monitor spatiotemporal distribution of radiotracer in vivo. The spatiotemporal information can be used to estimate parametric images of radiotracer kinetics that are of physiological and biochemical interests. Direct estimation of parametric images from raw projection data allows accurate noise modeling and has been shown to offer better image quality than conventional indirect methods, which reconstruct a sequence of PET images first and then perform tracer kinetic modeling pixel-by-pixel. Direct reconstruction of parametric images has gained increasing interests with the advances in computing hardware. Many direct reconstruction algorithms have been developed for different kinetic models. In this paper we review the recent progress in the development of direct reconstruction algorithms for parametric image estimation. Algorithms for linear and nonlinear kinetic models are described and their properties are discussed. Dynamic positron emission tomography (PET) provides the additional temporal information of tracer kinetics compared to static PET. It has been shown that tracer kinetics can be useful in tumor diagnosis such as differentiation between malignant and benign lesions [1, 2], and in therapy monitoring where the kinetic values from dynamic PET can be more predictive for assessment of response than the standard uptake value at a single time point [3, 4]. There are basically two approaches for deriving tracer kinetics from dynamic PET data: region-of-interest (ROI) kinetic modeling and parametric imaging [5-7]. The ROI based approach fits a kinetic model to the average time activity curve (TAC) of a selected ROI, so it is easy to implement and has low computation cost. In contrast, parametric imaging estimates kinetic parameters for every pixel and provides the spatial distribution of kinetic parameters. It is thus more suitable to study heterogeneous tracer uptake in tissue. Parametric images have been found useful in many biological research and clinical diagnosis [8-10]. However, parametric imaging is more demanding computationally and more sensitive to noise in dynamic PET data than the ROI-based kinetic modeling. Obtaining parametric images of high quality therefore raises new challenges that were not faced by conventional ROI-based methods . The typical procedure of parametric imaging is to reconstruct a sequence of emission images from the measured PET projection data first, and then to fit the TAC at each pixel to a linear or nonlinear kinetic model. To obtain an efficient estimate, the noise distribution of the reconstructed activity images should be modeled in the kinetic analysis. However, exact modeling of the noise distribution in PET images can be difficult because noise is spatially variant and object-dependent. Usually the spatial variation and correlations between pixels are simply ignored in the kinetic fitting step, which can lead to very noisy results. Direct reconstruction has been developed to reduce noise amplification in parametric imaging. Direct reconstruction methods combine tracer kinetic modeling and emission image reconstruction into a single formula to estimate parametric images directly from the raw projection data [12, 13]. Because PET projection data are well-modeled as independent Poisson random variables, direct reconstruction allows accurate compensation of noise propagation from sinogram measurements to the kinetic fitting process. It has been shown that images reconstructed by direct reconstruction methods have better bias-variance characteristics than those obtained by indirect methods for both linear models [33, 34] and nonlinear kinetic models [25, 29]. One drawback of direct reconstruction of parametric images is that the optimization algorithms are more complex than indirect methods [12, 13], due to the intertwinement of the temporal and spatial correlations. In addition, when compartment models are used, the relationship between the kinetic parameters and PET data also becomes nonlinear. Therefore, the development of efficient optimization algorithms for direct reconstruction is of high significance. The theory of direct reconstruction of parametric images was developed right after the publication of the maximum likelihood (ML) expectation-maximization (EM) algorithm for static PET reconstruction . In 1984, Snyder  presented an ML EM algorithm to estimate compartmental parameters from time-of-flight list-mode data. Carson and Lange  in 1985 presented an EM algorithm for maximum likelihood reconstruction of kinetic parameters from PET projection data. However, neither of these algorithms was validated using a realistic simulation or real data at the time, possibly due to the limitation of computing hardware. In 1995, Limber et al  combined a least squares reconstruction with the Levenberg-Marquardt (LM) algorithm  to estimate the parameters of a single exponential decay model from SPECT projection data. Separable nonlinear least squares were used by Huesman et al  in 1998 to estimate kinetic parameters of a one-tissue compartment model from 3D SPECT projection data. To reduce computation cost, several researchers also developed methods for direct estimation of kinetic parameters for ROIs instead of reconstruction of the whole parametric images, e.g. [18-22]. These algorithms are only efficient for a small-scale problem with a limited number of ROIs. When the number of unknown parameters goes beyond a few hundreds, both the LM algorithm used by Limber et al  and the separable nonlinear least squares used by Huesman et al  become inefficient. The development of algorithms that are suitable for large-scale direct estimation began to attract more and more attention with the recent advances in computing technology. In 2005, a parametric iterative coordinate descent (PICD) algorithm was proposed by Kamasak et al  for penalized likelihood estimation of parametric images of a two-tissue compartment model. To our knowledge, this was the first demonstration of direct parametric reconstruction on a dense set of voxels. Yan et al  proposed a new EM algorithm for direct ML reconstruction of kinetic parameters of a one-tissue compartment model. Both Kamasak's PICD and Yan's EM algorithms are specific to their respective compartment models. To simplify practical implementation, Wang and Qi in 2008 proposed generalized optimization transfer algorithms for direct penalized likelihood reconstruction of parametric images that are applicable to a wide variety of kinetic models [28, 29]. The algorithms resemble the empirical iterative implementation of the indirect method that alternates between an image reconstruction update and kinetic fitting step (e.g., [26, 27]), but have the advantage of guaranteed monotonic convergence to the direct estimate. Later Wang and Qi [31, 32] also proposed an EM-based optimization transfer algorithm for direct penalized likelihood reconstruction that has faster convergence rate, especially at situations with low background events (randoms and scatters). Direct reconstruction of parametric images for linear kinetic models has also been developed due to its computational efficiency. In 1997, Matthews et al  used the ML EM algorithm to estimate the parametric images of a set of linear temporal basis functions. Meikle et al  in 1998 presented a direct reconstruction for the spectral analysis model using the non-negative least squares method. Mathematically, direct reconstruction of linear parametric images is essentially the same as dynamic image reconstruction with overlapping temporal basis functions, such as B-splines . To avoid pre-defined basis functions, Reader et al also proposed a method to estimate the linear coefficients and temporal basis functions simultaneously . To obtain physiologically relevant kinetic parameters directly, Patlak model has been incorporated into direct reconstruction by defining two temporal basis functions as the blood input function and its integral . In 2007, Wang et al  presented a maximum a posteriori (MAP) reconstruction of the Patlak parameters using a preconditioned conjugate gradient (PCG) algorithm. Tsoumpas et al  presented an ML EM algorithm for direct Patlak reconstruction. Li and Leahy , and Zhu et al  developed direct reconstruction of the Patlak parameters from list-mode data. Tang et al  used anatomical prior information to improve the Patlak reconstruction. Rahmim et al used the AB-EM algorithm  to allow negative values in the direct estimation for a Patlak-like graphical analysis model . It has been observed that the strong correlation between the two temporal basis functions in the Patlak model slows down the convergence speed of the direct reconstruction. A nested EM algorithm was developed by Wang and Qi  to improve the convergence rate of direct linear parametric reconstruction. In this paper we will provide an overview of the recent progress in the development of direct reconstruction algorithms. We will describe technical details of different algorithms and analyze their properties. Methods for direct reconstruction of linear and nonlinear parametric images as well as for joint estimation of parametric images and input function will be included. We expect the information in this review will provide useful guidance to readers for choosing a proper direct reconstruction method. where and denote the start and end times of frame , respectively, and is the decay constant of the radiotracer. is the tracer concentration in pixel at time and is determined by a linear or nonlinear kinetic model with the parameter vector . is the total number of kinetic parameters for each pixel. where , the th element of the system matrix , is the probability of detecting an event originated in pixel by detector pair , and is the expectation of scattered and random events at detector pair in the th frame. is the total number of image pixels. where is a identity matrix and denotes the Kronecker product. Equation (6) is the form for practical implementation and equation (7) is more suitable for algorithm analysis. where denotes the feasible set of the kinetic parameters (e.g. satisfying nonnegativity or box constraints). The resulting images from ML reconstruction at convergence are often very noisy because the tomography problem is ill-conditioned. In practice, the true ML solution is seldom being sought. Rather images are regularized either by early termination before convergence or using a penalty function or image prior to encourage spatial smoothness. where is a smoothness penalty and is the regularization parameter that controls the tradeoff between the resolution and noise. If is too small, the reconstructed image approaches the ML estimate and becomes very noisy; if is too large, the reconstructed image becomes very smooth and useful information can be lost. and is the potential function. denotes the neighborhood of pixel ; is the weighting factor equal to the inverse distance between pixels and . A typical neighborhood includes the eight nearest pixels in 2D and 26 nearest voxels in 3D. The basic requirement of is that it is even and non-decreasing of . A common choice in PET image reconstruction is the quadratic function . The disadvantage of the quadratic regularization is that it can over-smooth edges and small objects when a large is used. To preserve edges, non-quadratic penalty functions can be used. Examples includes the absolute value function , the Lange function , and other variations [45, 46]. Nonconvex penalty functions can also be used to even enhance edges, but they are much less popular because the resulting objective function may have multiple local optima. where is the total number of basis functions, is the th temporal basis function and is the coefficient to be estimated. The temporal basis functions can be divided into two categories. The first category primarily focuses on efficient representation of time activity curves. Examples include B-splines [48-50] and wavelets , as well as those obtained from principal component analysis  or adaptively estimated from PET data . One advantage of these basis functions is that they can represent a wide variety of time activity curves. A disadvantage is that the associated coefficients are not directly related to the kinetic parameters of physiological interest. Kinetic modeling is often required to estimate kinetic parameters from the TACs after reconstruction. In comparison, the second category to be described below provides linear coefficients that are directly related to the kinetic parameters of interest. where is the time for the tracer to reach steady state. The Patlak slope represents the overall influx rate of the tracer into the irreversible compartment and has found applications in many disease studies. For example, is proportional to the glucose metabolic rate in FDG scans. In some applications, the plasma input function can also be replaced by a reference region input function . where the cumulative time activity is expressed as a linear combination of the same two basis functions as those in the Patlak plot. To use the RE model, all the time frames should start from so that the reconstructed dynamic images represent the cumulative time activity . One consequence is that the projection data in different frames are no longer independent, so the likelihood function in (9) needs some modification to obtain a true ML estimate. In addition, the intercept in Eq. (24) is usually negative, which makes the classic EM algorithm not applicable to the resulting direct reconstruction. The model equation (26) is now suitable for direct reconstruction using the classic EM algorithm because the coefficient and the basis function are both nonnegative when . Note that can also be replaced by a reference region TAC to calculate DVR. Similar to static PET reconstruction, the convergence of the parametric EM algorithm can be very slow. Preconditioned conjugate gradient (PCG) algorithm and other accelerated algorithms [57, 58] can be used to achieve a faster convergence. One example of direct application of PCG to Patlak reconstruction can be found in . When negative values are present in the parametric images, such as those in the original relative equilibrium model (24), the AB-EM algorithm can be used . One disadvantage of direct reconstruction using a single system matrix is that the convergence can be extremely slow when the temporal basis functions are highly correlated as in the spectral analysis and Patlak model . This is because the combination of the temporal correlation and high spatial dimension results in an ill-posed problem that is much worse than the static PET reconstruction. One way to solve this problem is to decouple the spatial image update and temporal parameter estimation at each iteration using the nested EM algorithm described below. where , , and is the sub-iteration number in iteration . Each full iteration of the nested EM algorithm consists of one iteration of EM-like emission image update (37) and multiple iterations of kinetic parameter estimation (38). and converges to the global solution. It is easy to verify that the traditional EM algorithm in (34) is a special case of the nested EM algorithm with . By running multiple iterations of (38) with , the nested EM algorithm can substantially accelerate the convergence rate of the direct reconstruction of linear parametric images without affecting the overall computational time as the size of matrix is much smaller than that of the system matrix . This is clearly demonstrated by a toy example shown in Fig. 1 . Starting from the same initial image, the nested EM takes 6 iterations to converge to the true solution, while the traditional EM requires more than 60 iterations. The nested EM algorithm can be further accelerated by considering the nested EM algorithm as an implicit preconditioner and using conjugate directions . 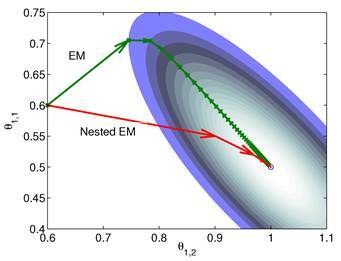 Isocontours of the likelihood function of a toy problem and the trajectories of the iterates of the traditional EM and the nested EM . The nested EM takes 6 iterations to converge to the final solution, while the traditional EM requires more than 60 iterations. Reprinted from  with permission. where , and are the kinetic parameter matrices that are formed by the rate constants in , and denotes the system input. where denotes the inverse Laplace transform. where with , and “*” denotes the convolution operator. The regularization term equals to with fixed at for all pixels other than pixel . The PICD algorithm uses an iterative gradient descent algorithm to update the linear parameters in and an iterative golden section search to estimate the nonlinear components. To accelerate the convergence rate and reduce computational cost, the PICD algorithm updates the linear parameters more frequently than the nonlinear parameters. The PICD algorithm is well suited for one- and two-tissue-compartment models. For kinetic models with more than two tissue compartments, however, the parameter transformation becomes too complicated. The PMOLAR-1T algorithm  is an EM algorithm for direct reconstruction of parametric images for the one-tissue compartment model. It is derived by introducing a new set of complete data that simultaneously decouples the pixel correlation as well as the temporal convolution. Here we introduce it using the optimization transfer framework. where . Here we approximate the convolution integral using the summation over uniformly sampled time points with being the time interval. and can be calculated by a look-up table. The original PMOLAR-1T algorithm  only uses one subiteration with . Based on our experience with the nest EM algorithm for linear models, we expect that the convergence rate of the PMOLAR-1T algorithm can be accelerated by using more than one subiterations . which substantially improved performance over the uniform weight. However, neither the uniform nor the nonuniform weights provides any theoretical guarantee of convergence because the quadratic function in (68) is not a proper surrogate function. It has been observed that the uniform weight can result in non-monotonic changes in the likelihood function, although the results with the nonuniform weighting are reasonably good. For example for the quadratic penalty and for the nonquadratic Lange penalty. Hence it minorizes the original objective function . The optimization of the quadratic surrogate function can be solved pixel-by-pixel in a coordinate descent (CD) fashion. However, the OT-CD algorithm is difficult to parallelize because of the sequential update. which can be solved by any existing nonlinear least squares methods (e.g. the Levenberg-Marquardt algorithm). In summary, each iteration of the OT-SP algorithm consists of two steps: an image update in (78) and a NLS fitting in (80). It has the simplicity of the iterative NLS algorithm, but guarantees a monotonic convergence with . Compared to the PICD and OT-CD algorithms, the OT-SP algorithm can be easily parallelized. A disadvantage of the OT-SP is that it requires the background to be positive for the quadratic surrogate function to work, so the convergence rate can be slow when the level of background events is low. A modified Levenberg-Marquardt algorithm was developed to solve this pixel-wise penalized likelihood fitting in . The OT-EM guarantees a monotonic increase in the penalized likelihood following the optimization transfer properties of . It can be much faster than the OT-SP algorithm when the level of background events (scatters and randoms) is low. In parametric image reconstruction, the blood input function is required to be known a priori. One standard method of measuring blood input is arterial blood sampling, which is invasive and technically challenging. An alternative to arterial sampling is to derive the input function from a blood region or a reference region in a reconstructed image . When the region used for extraction of the input function is of small size, the image-derived input function (IDIF) can be less accurate due to partial volume and other effects. Joint estimation of the input function and parametric images can potentially improve the accuracy of the IDIF as well as the parametric images by fitting the input function and parametric image to the data simultaneously [64, 65]. where denotes the feasible set of and the penalized likelihood function defined in (12) is rewritten here as an explicit function of . One method for joint estimation without an input region was presented by Reader et al . The algorithm was developed for the linear spectral analysis model. It uses the EM algorithm to find the ML estimation of the input function and the linear coefficients from dynamic projection data. Here we introduce it using the optimization transfer principle and describe how to extend it to nonlinear kinetic models. For a linear kinetic model, both above steps can be solved by the EM algorithm with multiple sub-iterations. When only one sub-iteration is used, it is equivalent to the algorithm in . For compartment models, the optimization in (87) can be solved by the modified Levenberg-Marquardt algorithm given in . The update of in (88) can still be solved by the EM algorithm. The joint estimation then estimates the kinetic parameters at pixels outside and the time activity curve inside simultaneously. where and are updated in an alternating fashion. for is updated by the Levenberg-Marquardt algorithm. The estimation of in ( (90) is a linear least squares problem that can be solved easily (e.g. by QR decomposition). Here we show some simulation results to demonstrate the advantage of direct reconstruction over indirect reconstruction. We simulated a 60-minute F-FDG brain scan using a brain phantom that consisted of gray matter, white matter and a small tumor inside the white matter. The time activity curve of each region was generated using a two-tissue compartment model and an analytical blood input function. Figure 2 shows the images reconstructed by an indirect method and the OT-EM algorithm and Figure 3 shows the corresponding images. Clearly the direct reconstruction results have much less noise than the indirect reconstruction results while maintaining the same spatial resolution. The improvement is similar to those observed in other studies for both linear and compartment models [25, 29, 33]. The true and reconstructed images by the indirect and direct algorithms . True and reconstructed images by the indirect and direct algorithms . We have provided an overview of direct estimation algorithms for parametric image reconstruction from dynamic PET data. Because of the combination of tomographic reconstruction and kinetic modeling, direct reconstruction algorithms are more complicated than static image reconstruction. Different algorithms have been developed to balance the tradeoff between simplicity in implementation and fast convergence. We hope that the information in this paper can provide guidance to readers for choosing the proper direct reconstruction algorithm in real applications. In some situations, the choice is clear. For example, the nested EM algorithm should be preferred over the traditional EM algorithm for linear parametric image reconstruction because the former converges much faster while preserving the same simplicity in implementation. In other situations, the choice may be more dependent on the user. We note that as long as the algorithm guarantees global convergence, a simple algorithm can still reach the final solution, albeit with a large number of iterations. We expect that direct parametric image reconstruction will find more and more applications in dynamic PET studies and more novel algorithms will be developed in the future. The authors would like to thank Will Hutchcroft for assistance in typesetting the manuscript. This work was supported by the National Institute of Biomedical Imaging and Bioengineering under grants R01EB000194 and RC4EB012836 and the Department of Energy under grant DE-SC0002294.